We've been based in the heart of Livingston since November 1995 and are West Lothian's only senior professional football club. Hundreds of people from Livingston and further afield come to watch our team on a regular basis, but we're always looking to attract new people to our matches at the 10,000 seat Energy Assets Arena, which is situated a stone's throw from Livingston town centre. We understand that attending a football match for the first time might be a wee bit daunting, so we've compiled a step-by-step guide of things you need to know! If there's anything we've missed, or you'd like to discuss visiting our Stadium further, give us a call on 01506 417000. Our first team competes in the SPFL 'Scottish Championship', which is the second level of professional football in Scotland. As well as playing a total of 36 league games each season we also take part in three national cup competitions, including the Scottish League Cup, which we won in 2004. We occasionally play in 'friendly' or challenge matches too. The football season runs from late July to early May and we play at home regularly during this period. The vast majority of our matches are played on a Saturday afternoon with kick off at 3pm, meaning that they finish at around 4.45pm. Some games are scheduled for 'midweek'. By this we mean Tuesday or Wednesday evenings, usually with a 7.45pm kick off. A list of our fixtures for the current season can be found here. How do I find the Energy Assets Arena? The Energy Assets Arena is located on Alderstone Road, a couple of hundred yards north of MacArthur Glen shopping centre in Livingston town centre and is well signposted from all approaches to the town centre. Our postcode for sat nav purposes is EH54 7DN. If you are travelling by bus, you should get off at Livingston Bus Terminal, which is less than five minutes walk away from the Stadium. Our stadium is located almost equal distance from Livingston North and Livingston South rail stations. Both are around 20-30 minutes walk away. Is there car parking at the Arena? Many of our supporters have parking permits for our car park, but there are always a number of spaces available on a game-by-game basis at a cost of £5 each. Further car parking is available in the town centre nearby. Some games this season WILL be all-ticket and advance purchase will be needed but for most games you need to pay cash at our turnstile gates around the Stadium. Gates usually open one hour prior to kick off. Standard admission prices can be found here. These arrangements can change in the event of us hosting a big match in one of the cup competitions. Which stand should I sit in? 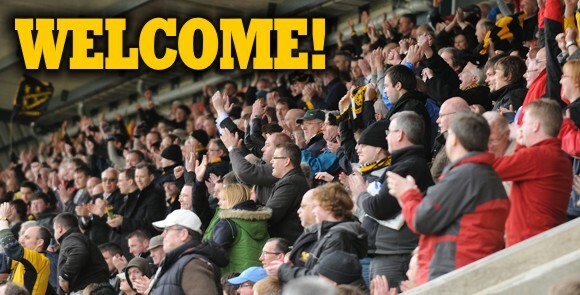 In general, we use two stands at our home games – the West Stand for Livingston supporters and the East Stand for supporters of the opposing team. Both of these areas offer unhindered side view of the pitch. Some of the seats in the West Stand are 'reserved' – these are the seats belonging to our season ticket holders. Our stadium is accessible to wheelchair users, though we have a limited number of sheltered spaces available. We would ask that you call us prior to your visit on 01506 417000 so that we can discuss any particular needs. If you need to bring a carer with you, we will admit this person free of charge. Is there food or drinks on sale? We have a wide range of hot food, hot and cold drinks and snacks available from the Stadium concession kiosks which are located in all stands. Alcoholic drinks are not permitted inside the Stadium, but we do have pay bar facilities open to all before the game in the Almondvale Suite (situated behind the South Stand) and Stadium Bar (West Stand). Both of these bars open at 12.30pm for a 3pm kick off, with bar meals also available in the Almondvale Suite. Is there anything I should or shouldn't bring with me? Our main suggestion is that you dress appropriately for the weather. As football takes place outside it can sometimes be a wee bit chilly – especially in Livingston! We do not have any ban on you bringing any food to the match, although we have hot food and drinks on sale from our Stadium kiosks. There are some items which you are prohibited from bringing into football stadia by law, including cans and bottles. Smoking is also prohibited. We have male, female and unisex disabled toilets available in all stands. How can I find out more about the players? All of our players are full time professional footballers. A list of our current first team players can be found here. On matchdays we publish and sell copies of 'ROAR' our official full colour club matchday magazine. Priced at £2.50, this includes player interviews, club news and other information.